Funko continues to expand its popular Star Wars Hikari Sofubi vinyl figure series with one of the breakout stars of The Force Awakens, the mysterious Captain Phasma! A tough veteran commander, Captain Phasma commands the First Order's legion of Stormtroopers. 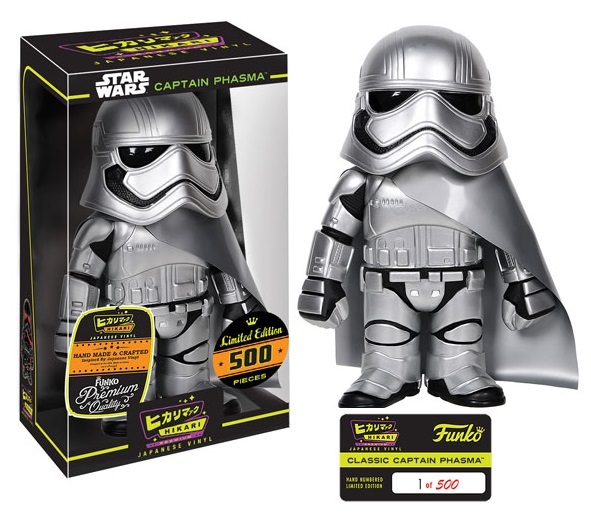 The Classic Edition Captain Phasma Hikari figure comes wearing her signature metallic silver Stormtrooper armor with matching metallic silver cape. Each Star Wars: The Force Awakens Captain Phasma Classic Edition Hikari includes a hand numbered card to prove authenticity and rarity, and comes packaged in a full color window box perfect for display. Limited to 500 pieces, this Star Wars Hikari vinyl figure can be pre-ordered now at Entertainment Earth for $79.99 here.